The Buzz around this production continued to spread and fast forward two years, under the new title ‘MYTH’ the show has been updated and developed into a new genre of musical and one that screams out to every generation. 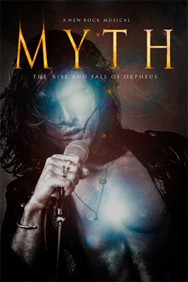 A modern retelling of the Ancient Greek tale of Orpheus and the underworld, MYTH takes an intimate look at the link between mental illness and addiction in the music industry and our society today. A frightening social and cultural problem that has taken the lives of some of musics brightest stars, Jim Morrison, Jimi Hendrix, Janis Joplin, Kurt Cobain and Amy Winehouse to name but a few.